What is the vision of your company? Do you have a strategy to fulfil this vision? Do you know what your competitive advantage is? Will your company succeed in the digital world? Are you certain your enterprise complies with all the legislative requirements? We will help you to prepare your strategy and set the right goals for your company. We will ensure compliance of your company with legislation, best practice recommendations (ITIL, PRINCE2, Lean) and international standards (ISO 9001, 20 000, 27 001). We will help you to embrace new trends such as DevOps, Agile, IT4IT, SIAM and others. 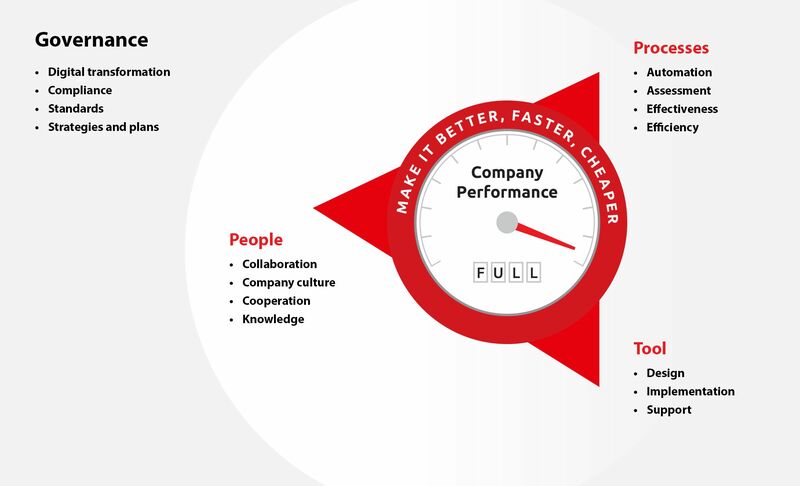 Be better (thanks to compliance and modern management), faster (thanks to digital transformations and agile approach) and cheaper (with higher efficiency and agility). It's simple – Deliver to the customers exactly what they want. But are you aware of all the activities that you perform? Isn’t complexity harming your productivity? Aren’t your employees doing unnecessary activities, thus driving high costs, insufficient quality of outputs, or simply not keeping deadlines? Do you regularly evaluate your processes based on properly set KPIs? We help you set up, optimize, streamline processes in your company and advise how to implement automation. Be better (higher quality of processes), faster (lean and automated processes), hence also cheaper. Do you have appropriate SW tools to effectively support your business? Don’t you pay unnecessarily high fees for duplicate SW tools? Do you know how to achieve optimization using SW tools and the best value for money? implement selected commercial and open-source SW tools (MS System Center, GLPI, Zabbix, OCS Inventory, ...). We help you to have all the necessary information connected, managed and safe. Be better (based on current information and reports), faster (by automating and speeding up processes with a suitable SW tool) and cheaper (with higher efficiency and lower costs of SW tools). How does the culture in your company look? Is information sharing among your teams a norm? Are the departments communicating transparently? Are the teams working together to achieve defined goals and execute strategy? We will help you to develop the right skills of your people, understand the world’s best practices and apply them in your company. We provide coaching and we will help you to set up an open corporate culture. Be better (by improving your people and enabling them to get the necessary knowledge), faster (by ensuring coaching to make communication and collaboration more efficient) and cheaper (by utilizing the full potential of your human resources). If you are interested in co-operation with us, please contact us on sales@omnicom.sk.